Prescribing opioids for chronic pain has become rare at Cleveland Clinic. It’s not appropriate for most patients. Today, we’re providing more effective pain management treatment for longtime opioid users. Any plan to start a patient on opioids must include measurable treatment goals and a directive to stop using opioids if goals aren’t met. At the time, many pain specialists believed that if opioid use were limited to legitimate indications, patients would not become addicted. But reality caught up with us. We learned that people who get started on opioids have a much higher conversion to active addiction than previously thought. Also, physical dependence on opioids develops quickly — and in some people turns into physical addiction. These huge addiction-related costs are a major reason why the pain medicine community has dramatically scaled back the use of opioids for chronic pain. But it’s not the only reason. Disappointing efficacy is another mark against the drugs. People originally thought opioids had no ceiling effect, but it turns out opioids don’t yield much pain relief in the chronic setting. After a while, patients are lucky to get 20 or 30 percent relief. Improvement of functional outcomes and general well-being is often even less. Many patients on chronic opioids feel worse overall because of the drugs’ now well-established side effects, including immunosuppression, endocrine abnormalities, constipation, sedation and depression. Cruelest of all, some patients experience worsened pain — opioid-induced hyperalgesia. So, when do we at Cleveland Clinic consider opioids for chronic pain conditions? We commonly use them to treat cancer pain, either alone or in combination with other therapies. We’ll also consider them when there are medical contraindications to other choices for chronic non-cancer pain control. In those cases, we use opioids in low doses and aim to maintain a steady dose. In general, high doses are rarely successful. Continued opioid use is contingent on demonstrated improvement in functional outcomes, not just pain scores. If you give an antibiotic for a UTI and it doesn’t treat the infection, you stop it. The same principle applies to opioids. Today we’re working harder to address the needs of patients who have endured longtime opioid use. It’s particularly important now that many unscrupulous providers have stopped prescribing opioids in the wake of regulatory crackdowns, leaving their patients desperate for new prescribers. 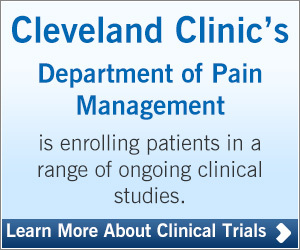 Cleveland Clinic’s Department of Pain Management has implemented a new approach for managing these displaced patients. The essence is simply evaluating a patient’s pain and opioid use and getting them to the right provider. Patients who have an addiction are referred to Cleveland Clinic’s Alcohol and Drug Recovery Center or its distinctive interdisciplinary Chronic Pain Rehabilitation Program. The latter is a comprehensive three- to four-week outpatient program designed to reduce both pain and chemical dependency and help patients foster coping skills and improved function. Once addiction is addressed, we restart the patient’s pain management with a proper evaluation to uncover underlying causes of their pain. That typically leads to a multimodality treatment strategy that may include psychological approaches, interventional treatments, physical therapy and more. Dr. Rosenquist is Chairman of Cleveland Clinic’s Department of Pain Management.